Amy McCullough is this week’s guest. The journalist, filmmaker, actress and UT grad student will talk to us about her debut book, The Box Wine Sailors- Misadventures of a Broke Young Couple at Sea. Want to hear previous interviews? Try the search bar above, or just scroll through the shows below. You can find our podcasts on iTunes. You can keep up with us by heading over to Facebook and you can follow us on Twitter. 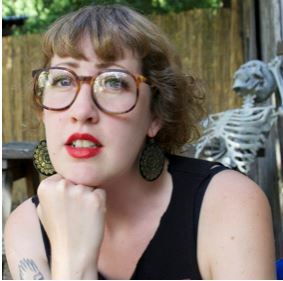 Amy McCullough is the former music editor of Willamette Week, Portland, Oregon’s Pulitzer Prize–winning alt-weekly newspaper. She has also written for SAIL Magazine, Eugene Weekly, and Finder, Willamette Week‘s annual, magazine-style guide to Portland. In addition to writing, she makes independent music, music videos, and movies with her partner and former shipmate, Jimmie. The duo’s first feature-length production, Operation: RAVEN—which stars McCullough as tough-as-nails detective Sheila Raven—premiered in association with the Austin Film Festival in February of 2014. Their follow-up, Beast Lover, premiered the following November at Zed Fest in Burbank, California. Amy holds a Bachelor of Arts in Creative Writing from Loyola University Chicago and is currently a master’s student and graduate teaching assistant in the Department of Geography and the Environment at the University of Texas at Austin. 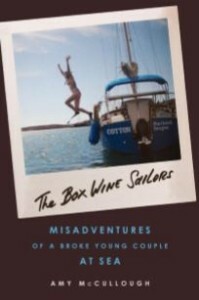 The Box Wine Sailors – Misadventures of a Broke Young Couple at Sea is her first book, and is published by Academy Chicago, an imprint of Chicago Review Press. Everyone wants to sail away. But who does? Rich people, retirees, actual sailors—and these two. Amy and Jimmie were not sailors. Their experience included reading a few books, watching a couple of instructional videos, and sailing once a week for a year. They were land-lubberly, middle-class twentysomethings, audacious and in love. All they wanted was to be together and do something extraordinary. They quit their jobs, bought a boat that was categorically considered “too small” for ocean sailing, and left Portland, Oregon, for the Sea of Cortez. The Box Wine Sailors tells the true story of their ramshackle trip down the coast, with all the exulting highs and terrifying lows of sailing a small boat on the Pacific. From nearly being rammed by a pair of whales on Thanksgiving morning and the terrifying experience of rounding Punta Gorda—hanging on to the mast for dear life and looking about at what seemed like the apocalypse—to having their tiller snap off while accidentally surfing coastal breakers and finding ultimate joy in a $5 Little Caesar’s pizza. It also tells the story of two very normal people doing what most people only dream of, settling the argument that if you want something bad enough you can make it happen. For more information, visit theboxwinesailors.com.